Re: Motorcycle Policeman Hargis said Limo stopped ! Heavily distracted witnesses make poor witnesses. Are doctors good at telling the top of the head, or the right front of the head from the right rearward part of the head? Of telling the difference between the cerebellum and the cerebrum? Ordinarily, yes. Are people good at spotting the ‘gorilla’ when they see a man in a gorilla suit walk across the frame and beat his chest? Ordinarily, yes. **** make an emergency transfusion of blood. **** hook up an IV to introduce other critical medicine. **** check, and check again, and again, and again, the heartbeat and breathing, so they can know, as soon as possible, if any disparate action needs to be done immediately, like opening up the chest. And not get distracted making unimportant observations, which can wait until the most critical tasks are completed and the patient is, at least, somewhat stablished. Until then, they are no more likely to notice the type of brain matter showing than they are to notice that one of the nurses is wearing a gorilla mask. “ I then examined the wound in the back of the President's head. This was a large, gaping wound in the right posterior part, with cerebral and cerebellar tissue being damaged and exposed. There was considerable blood loss evident on the carriage, the floor, and the clothing of some of the people present. I would estimate 1,500 cc. of blood being present. Mr. SPECTER - Would you state your full name for the record, please? Dr. CLARK - William Kemp Clark. Mr. SPECTER - Will you outline in a general way your educational background, please? Dr. CLARK - Yes. I graduated from the University of Texas in Austin, 1944. I graduated from the University of Texas Medical Branch at Galveston in 1948. I interned at Indiana University Medical Center and was a resident in surgery there from 1948 to 1950. I spent 2 years in the Air Force and then took my residency in neurological surgery at Columbia Presbyterian Hospital in New York City. This was from 1953 to 1956, at which time I came to the University of Texas, Southwestern Medical School, as chairman of the division of neurological surgery. Would you like the professional qualifications? Mr. SPECTER - Yes; may I have the professional qualifications in summary form, if you will, please. Dr. CLARK - I am board certified by the American Board of Neurological Surgery. I am a Fellow with the American College of Surgeons. I am a member of the Harvey Cushing Society. Mr. SPECTER - What is the Harvey Cushing Society, by the way? Dr. CLARK - It is the largest society of neurological surgeons in the world. Ok, so I'll ask again: how did fragments from this missing skull end up on the South (left) side of Elm street? So, basically what you're saying is that not one, not two, but twenty "distracted" medical professionals all independently confused the top of a patient's head with the back of his head. Can anyone predict exactly where the fragments of an object that explodes are going to land when struck by a high velocity bullet? The answer is no. How about looking at the trajectory of a bullet being fired from the 6th floor window to where the limousine and JFK were located( to scale) by using a ruler and a spatial chart or map of Dealey Plaza? When you draw a straight line from the southwestern most window, 6th floor, straight through the limousine to the south side of Elm Street, look where the fragments land following the trajectory of the bullet. Right in line with where the Harper and Burris fragments were found. Except wouldn't a glancing shot on the right side of the midline have displaced the skull pieces to the right (and perhaps up), but not forward and to the left? Do you remember James Altgens testifying that the head matter came in his direction? He also mentioned during one of his interviews later on that some matter landed near his feet. I look at it this way. The car was traveling on an "S" curve, but, was in a direct line with Oswald's rifle. 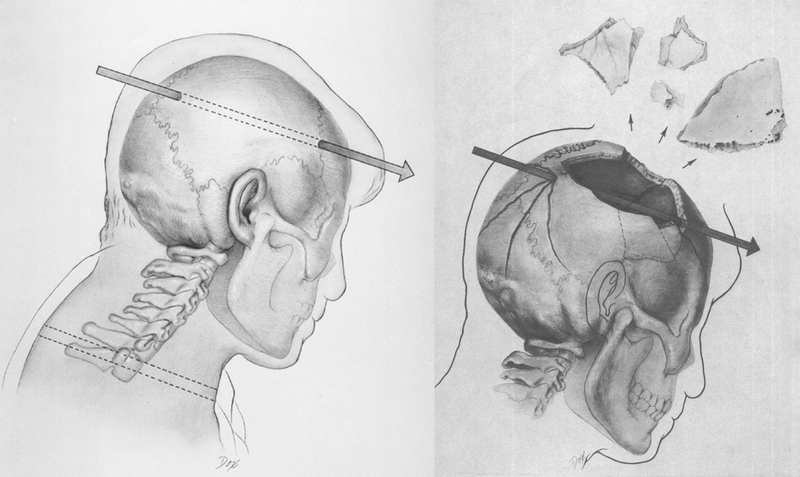 The bullet entered the head which was tilted forward and turned to the left, and exited at the top of the skull sending skull fragments into the air along with particulate matter ( which is much lighter in weight compared to skull fragments) in all directions forward which splattered all over the inside of the car, outside of the car on the hood, the windshield, the sun visors (both sides) on the "side rails", the Connally's, Greer and Kellerman, Hargis, Martin and Chaney and of course Mrs. Kennedy. As I pointed out, the skull fragments flew in the direction the bullet was traveling and straight ahead was the south side of Elm Street where they landed. it's that simple. Since when does a full metal jacketed bullet explode in your head and generate a plume of plasma? Ans: never. She couldn't have possibly seen the President's head before Clint Hill's suit coat was covering it before he was even removed from the vehicle and placed onto the gurney. Again, the top of the head, not the back, was blown off. Let us have your witnesses to a "top of the head" wound, Steve.